A proper Starship Troopers sequel is on the way, and you can see it in theaters during a one-night-only special event later this year. Would you like to know more? Sure you would. Starship Troopers: Traitor of Mars, a feature-length CGI animated sequel, is going to arrive in select theaters on August 21 in honor of the 20th anniversary of the original Starship Troopers. According to The Hollywood Reporter, Sony Pictures is teaming with Fathom Events to bring the Starship Troopers sequel to theaters. The event will take place in roughly 500 theaters across the country, with 7:30 p.m. and 10 p.m. showings available in each market. There will also be interviews with the filmmakers and behind-the-scenes footage included in each screening. "C'mon You Apes, You Wanna Live Forever?! I have only one rule. Everybody fights, no one quits. The bugs have breached Mars and the Federation's Fleet is too far to help. It's up to us to save the planet. On the bounce, Troopers! The only Good Bug is a Dead Bug! Oorah!" There have been several direct-to-video Starship Troopers sequels over the years, but none of them were really a true continuation of Paul Verhoeven's cult classic. However, Starship Troopers: Traitor of Mars is bringing back both Casper Van Dien and Dina Meyer as Federation troopers Johnny Rico and Dizzy Flores, respectively. 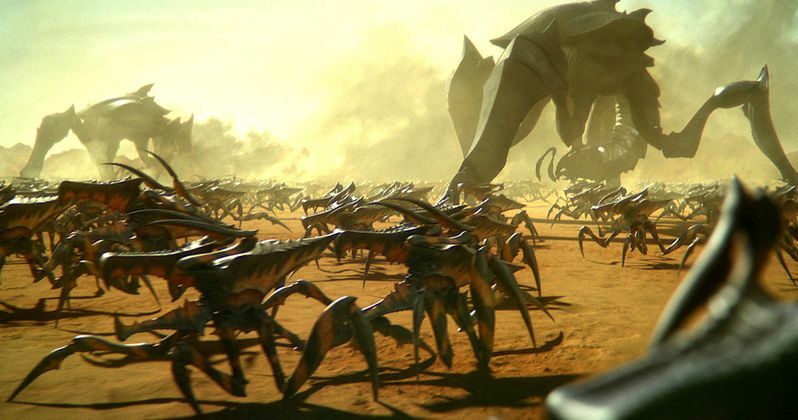 Not only that, but the script for this new CGI Starship Troopers sequel was written by Ed Neumeier, who wrote Robocop, as well as the original Starship Troopers. So this is very much the sequel many fans have been waiting for. The only possible problem is that it isn't live-action, but that may not be a problem at all, depending on your perspective. Sony Pictures also released the very first trailer for Trator of Mars and, CGI or not, it definitely looks like a Starship Troopers movie. The plot of this movie will center on Rico, who has been demoted and stationed on Mars, unaware of an impending, secret bug attack. It will be up to him and a team of new recruits, which includes comedian DeRay Davis as a brand new character, to hold down the fort. The teaser is brief, but it looks like there is going to be a whole lot of bug killing, outer space action to go around. Starship Troopers has become a beloved cult-classic over the years, despite the fact that it was a tremendous box office bomb when it was released in 1997. The movie grossed just $121 million, carrying a huge production budget of $105 million. But, given the loyal fan base, Sony felt it was worth doing a proper sequel in the form of Starship Troopers: Traitor of Mars. Be sure to check out the first trailer for yourself below and, if you want to check it out in theaters this August, tickets for the one-night-only event go on sale June 19.